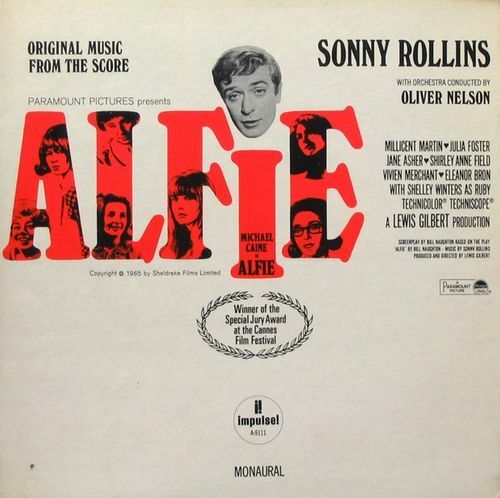 Alfie, the Sonny Rollins soundtrack of the prize-winning English movie starring Michael Caine, deserves to be ranked alongside Saxophone Colossus and A Night At The Village Vanguard as one of the tenor saxophonist’s major achievements. Largely on account of his unbelievable improvisations in Alfie’s Theme. In the years preceding Alfie, Sonny Rollins had developed into a top-rank performer able to bid a high price for his beloved art form. A lucrative contract with RCA after the tenorist’s legendary, mysterious sabbatical ‘under the Williamsburg Bridge’ from 1959 to 1961 led to a series of five albums for the major label, starting with The Bridge, ending with The Standard Sonny Rollins. In the early and mid-sixties, Rollins, always the contemplative intellectual, self-critical to the point of exhaustion and switching between sidemen continuously, was on a constant search for new means of expression. Keeping it fresh, tryin’ or dyin’, elusive as far as style is concerned, Rollins defied a sound definition of his personality. Albums with standards and the sole bossa tune alternated with extremist free jazz outings like Our Man In Jazz in 1962 and the intriguing, endearing cooperation with Coleman Hawkins on Sonny Meets Hawk in 1963. 1965’s adventurous On Impulse preceded Alfie, which was followed up by the full-blast avantgarde effort with John Coltrane’s famous associates Elvin Jones and Jimmy Garrison plus Freddie Hubbard, East Broadway Run Down, a high-level album that, however, didn’t fully delivered on its promise. On the other hand, Alfie becomes more beautiful with every turn on the table. Given the sensitivity and critical attitude of Rollins in regard to obtrusive sidemen, particularly pianists, it is remarkable that the large ensemble context of Alfie works so well. Oliver Nelson’s flexible, spot-on arrangements keep Rollins on his toes. If there is one let-down on this album, it is the fact that the couple of major league colleagues in the reed chairs, Phil Woods and J.J. Johnson, aren’t allowed solo space. Kenny Burrell and Roger Kellaway have ample room to make their mark, and, admittedly, make the most of it. Kellaway’s gentle touch contrasts nicely with the forceful Rollins and the pianist performs particularly well in Alfie’s Theme Differently, building on the dying notes of Rollins’ off-centre bits with zest. Burrell is peppery throughout, switching between fluently archetypical blues lines, shimmering clusters of notes and crunchy chords. The bit of undercooled, breathy balladry of Rollins in He’s Younger Than You Are is a genuine nod to Coleman Hawkins. But before you know it, Rollins has ended the tune with a sweeping arc of majestic wails. Rollins, the rhythm king, is in evidence on Street Runner With Child, a collage of romantic solo piano, fast-paced blaxploitation flic-type flights and the recurring reference to Alfie’s Theme, is the only tune on the album that reminds us of the fact that Alfie is a soundtrack. The free playing of Rollins, mixed interestingly with a constant eye on the melody, is most evident in Alfie’s Theme Differently and Transition, while the contrast between the lithe rhythm and meandering lines of On Impulse (a title made up on impulse while Sonny was thinking about his album On Impulse also on the Impulse label the year before?) ignites a dreamy vibe. Rollins in a great mood. It’s getting even better, because, without the shadow of a doubt, Alfie’s Theme is the albums’s hors d’oeuvre. The large ensemble transports the catchy line to the terrain where Ray Charles drove his tunes home to in the fifties. Drive. Propulsion. Courtesy of Oliver Nelson’s fleshy, well-timed horn sections and the probing rhythm tandem of bassist Walter Booker and drummer Frankie Dunlop. Burrell and Kellaway flourish, but Sonny Rollins is the star of the show, performing one of his all-time great solo’s. 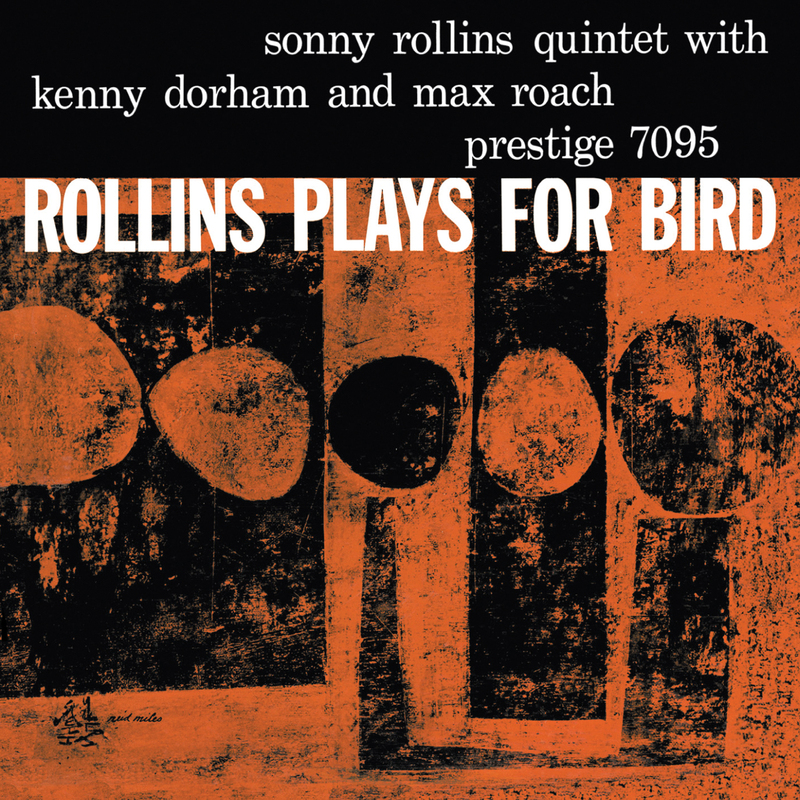 In a structured exploration of the basic theme, Rollins grabs the melody by its sleeve. Then he pauses deliberately for a while, like a girl that’s playing hard to get, indulges in a rumble of percussive blocks of short-ringing notes, lingers on new notes like a guest savoring a star restaurant dessert, wanders off into the avantgarde jungle, subsequently swings back into bop mode, alternating double timing, honks and forceful wails, moving into scales with the flick of a, highly skilled, tongue and continues to blow confidently over the sounds of the repeated brass and reed statements. Rollins explores every corner of the melody, rhythm-wise, harmony-wise, returning to it almost every few bars and all the while displaying his big, imposing sound. Rounding off the proceedings in style, Rollins ends his solo with an explosive note. Lots of proteines in the meal of Sonny, which after all, maybe, wasn’t a high-brow dinner but a reinvigorating eggs and sausage and a side of toast, coffee and a roll, hashbrowns over easy, chili in a bowl, with burgers and fries (now, what kinda pie? )… Full stomach tenor! Sonny Rollins at his best, speaking eloquently to both mind and soul. And as a natural consequence, a peak moment in jazz. 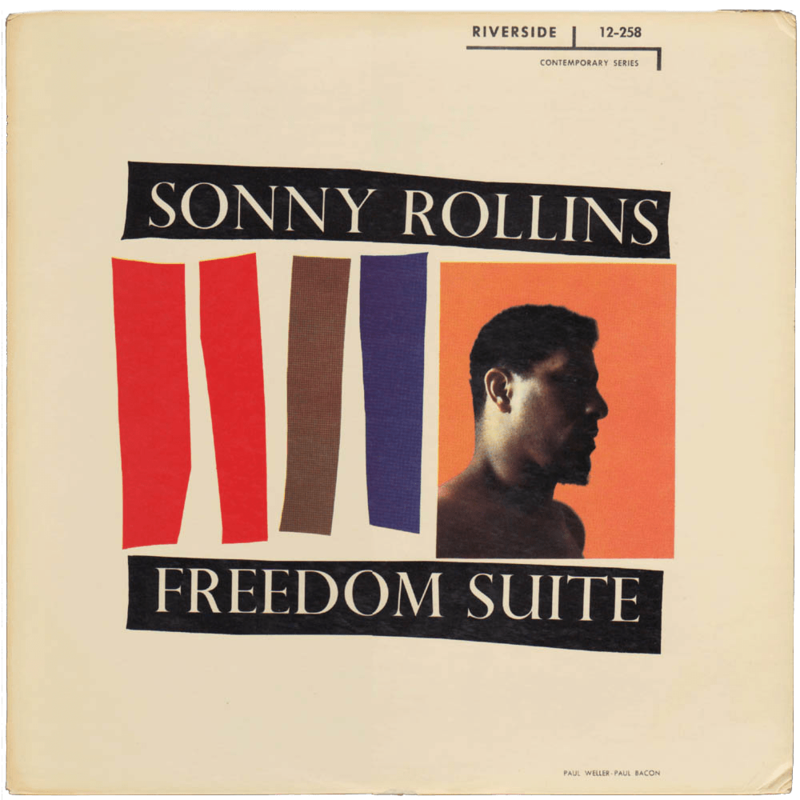 The title track of Sonny Rollins’ provocative 1958 album Freedom Suite takes up the whole of side A. Does anybody ever care to continue listening to side B’s set of Broadway and pop reworkings in one sweep? I would guess not. Notwithstanding the merits of those intriguing pop interpretations, the Freedom Suite is just too overwhelming. It begs to be relistened once the needle is off. The image of Sonny Rollins on the front cover might be explained as the visual companion to his written words. Rollins, half-naked, cast in shadows, with a hurt, yet defiant countenance, looks purported to resemble a slave. It connects with the parts of the suite that bear an eerie resemblance to chain gang songs. First and foremost, Sonny Rollins lets the music speak for itself. The Freedom Suite (the title track) combines the harmonic daring and fervent drive of Rollins and the controlled fire and melodic finesse of his companions Max Roach and Oscar Pettiford. It’s built on three movements of similar, short melodies and fascinates from start to finish. In the opening melody, a tacky, jingle-like cluster of phrases that show Rollins’ affinity with the playful, quixotic themes of Charlie Parker, Rollins takes seven minutes to explore every angle of the melody. Pushing or pulling the beat, veering between registers by way of an assertive flurry of arpeggio’s, Rollins glues together heartfelt sweeps and humorous asides. Oscar Pettiford sternly pushes along the loping rhythm. Max Roach concentrates almost as much on melody as Rollins; constantly favouring snare and toms above cymbals, Roach ferociously mirrors the instant gems Rollins cooks up. It’s a spontaneous, exciting group performance. After a pause, the trio sets in the rollicking theme that sounds like a chain gang or slave boat song. Paradoxically, it also has the giddy-up bounce of a cowboy song. Via a couple of a capella Rollins phrases, it segues into a beautiful ballad. It’s not a blues, but blues feeling is at its core. The husky delivery of Rollins is supported succinctly by Roach and Pettiford. They take plenty of room, as in the first movement, to display their excellent solo qualities. Roach and Rollins shared a lot of experience, having collaborated in the Max Roach/Clifford Brown quintet and on a couple of Rollins albums, among them the landmark album Saxophone Colossus. After another chain gang bounce intermezzo, Rollins thrusts himself headlong into a short melody at breakneck speed. It’s the Sonny Rollins of Live At The Village Vanguard 1 & 2, elaborating on bebop principles with fresh, harmonic elan. The near-anarchic Rollins is in top form, beginning and ending phrases where you least expect them to. The piano-less endeavor has clearly worked in Rollins’ favour. Freedom Suite possesses a rugged beauty. Before Freedom Suite, Rollins had recorded succesfully with piano-less trio’s on Way Out West and the beforementioned Village Vanguard albums. He would continue displaying his fascination for the format with The Bridge in 1961. Rollins is admired for his knack of finding and transforming often obscure Broadway, Tin Pan Alley and pop melodies. The interpretations on Freedom Suite have that typical Sonny Rollins sound of surprise, but lack the bliss of renditions such as There’s No Business Like Show Business (from Worktime) The production doesn’t work in his favor as well. The sound of the rhythm section is pretty flat and dry – listening to Max Roach cardboard box sound, one feels inclined to assume that it must’ve been Riverside’s objective to re-create the demo sound of a live gig at Minton’s Playhouse in the late fourties. Of these reworkings, Will You Still Be Mine is the most interesting. The intricate rhythm work of Roach and Pettiford intensifies the mood of Rollins, who reacts with an extravagant climax. The call and response between Rollins and Roach on Someday I’ll Find You is an attractive asset to a pretty melody. Till There Was You – also recorded by The Beatles in 1962 – is a sax-bass duet for the biggest part. Rollins succesfully avoids its corny character. The only time Sonny Rollins doesn’t seem up for his task is on Shadow Waltz. He sounds detached, unable to get under the skin of the melody. Sonny’s statements in the sleeve notes ring through. Both daily life (housing, employment) and law (the victory of Brown vs Board Of Education backfired) still put blacks in disadvantage around 1958. Racism persisted around the country. A disproportionate number of poor blacks had died in the Korean war. But being a musician, being the continuously inventive Sonny Rollins, the music of Freedom Suite is what speaks most eloquently. Rollins doggedly met the challenge of the experimental title track and showed what jazz is all about.